An interesting red blend is a favorite type of wine for me, especially if I can name the grapes without looking. I don't think I could have named all five grapes in Cimarone's 2010 Cilla's Blend without help, but I did enjoy waving at them as I recognized them. This estate grown wine is made from grapes sourced in Cimarone's Three Creek Vineyard in the Happy Canyon of Santa Barbara AVA. The blend is 56% Syrah, 25% Cabernet Sauvignon, 7% Cabernet Franc, 6% Petit Verdot and 6% Malbec. There is more Cabernet Sauvignon and less Syrah and Cabernet Franc in the '10 than in the '09. Fermented in barriques, then aged 10 months in new and neutral French oak, this red blend carries its wood well. Doug Margerum, the winemaker of this vintage, exited the role of Cimarone's cellar man last year and Andrew Murray stepped in fill his shoes. Cimarone said on Twitter, "From 2011 forward, it's an Andrew wine." Cimarone's owner Roger Higgins showed his sentimental side when he named the blend after his wife, Priscilla. He calls it “a wine of beauty and elegance - just like Cilla.” Some guys really know how to make it tough for the rest of us. The wine sold for $20 per bottle, but it's listed as sold out on the website. The folks at Cimarone were kind enough to send me a sample to write about. The '10 Cilla's Blend shows a fairly dark ruby color and whiffs a tad heavy on the alcohol until the 14.5% abv settles down. Blueberry and blackberry aromas hit hard and fast, leaving room for just a hint of black pepper and anise. Notes of cassis creep in after the glass has been sitting for awhile. The flavors are similarly fruit-laden, with a breath of pencil shavings and licorice. Taste it with feta cheese or, of course, steaks. Sequoia Grove Winery sits on 22 acres of prime Napa Valley real estate, on what's known geologically as the Rutherford Bench. Mineral-rich soil, warm sunshine and morning fog combine to make what most folks think of as ideal growing conditions for wine grapes. President and Director of Winemaking Michael Trujillo has been with Sequoia Grove since its inception in the early 1980s. Winemaker Molly Hill uses fruit sourced mainly from Sequoia Grove's original estate vineyard and their more recently purchased Tonella Estate Vineyard in Rutherford. They also acquire grapes from other Napa Valley growers. The Sequoia Grove Napa Valley Chardonnay 2011 is produced and bottled in Rutherford, under the sequoias on the family-owned property. From the Sequoia Grove website, "These Chardonnay grapes come mostly from Dijon and Wente clones grown in the renowned Carneros District in Napa Valley. We buy fruit from the Beckstoffer Vineyard, the Haire Vineyard, the Ghisletta Vineyard, and Kate’s Vineyard in Oak Knoll." The wine sees no malolactic fermentation, so the malic acid remains in control. It is more lean than creamy. Still a mouthful, though, it carries a ripe 14.2% abv number. The wine is stirred on the spent Burgundy yeast cells for eight months and the finished product sells for $28. A sample was provided to me by Jarvis Communications. This Chardonnay has a nice, golden hue in the glass and displays a bouquet of pineapples, apples, apricots and lovely spices. A hint of floral notes really sets off the fruit. The palate is marked by flavors of sweet, red apples, lemons, peaches, papaya, and a nice touch of oak. Butter and vanilla notes testify to the barrel aging, and a very lively acidity serves as lip-smacking refreshment. Pair this wine with rich or creamy dishes and it won't disappoint. What started as an idle thought - “can I taste wines from all 50 U.S. states?” - has become a personal mission. 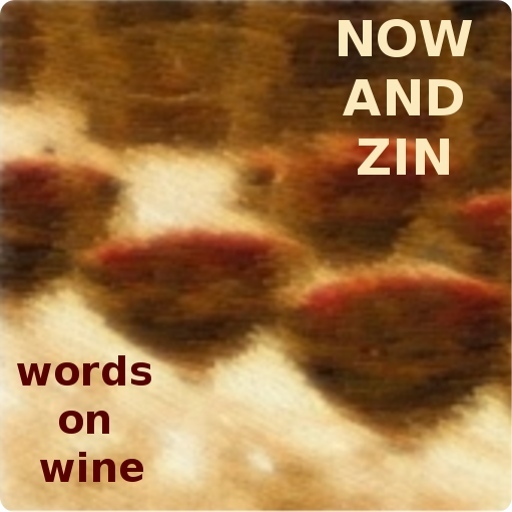 Now And Zin’s Wine Country series debuted nearly two years ago, and we have now tasted wine from 33 states. If you can make good wine in California, that's expected - not that it's easy, but it seems that’s what you’re supposed to do with great soil and perfect weather. Making good wine in areas of the country where nature isn’t quite as accommodating is a real achievement. I’ve sampled mead from Montana and Maine, Muscadine from Alabama and Kentucky Cabernet Franc. I’ve had a Super Tuscan-style blend from Arizona, mile-high wine from Colorado, amazing bubbles from Massachusetts, Michigan and Illinois, Zinfandel from Nevada and New Mexico, New York Riesling, New Jersey Merlot and North Carolina Chardonnay. I’ve tried wine made from Vermont apples, Florida blueberries, North Dakota rhubarb, West Virginia blackberries and Hawaiian Maui pineapples. 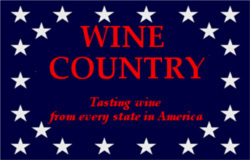 It has taken two years to sample wine from 33 states, so I may be at this for some time. I hear that a Delaware winery is still looking into their shipping permit. Aah, shipping wine in the United States. That has proven to be a stumbling block more than once so far. Contacts made in Arkansas, Kansas, Maryland, Ohio, Utah, Oklahoma and Wisconsin have dropped out of sight, while responses are hard to come by at all from Alaska, Wyoming, Connecticut, Louisiana, Mississippi, Rhode Island and South Carolina. I am sure for some of these states, I’ll probably have to find someone who makes wine in their garage. Any Mississippi garagistes out there? It was so nice to be included in the #winechat on July 17th, 2013, the subjects of which were some amazing white wines of Santa Barbara County, wines that are perfect for helping to beat the heat of the warm weather of summer. For the uninitiated, #winechat is a weekly gathering of wine lovers on Twitter, directed by Protocol Wine Studio. 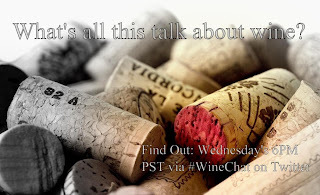 You don’t need an invitation for this affair, simply search “#winechat” and you are seeing the live stream. Join in if you like, or just drop in to see what people are tweeting about on Wednesday evenings at 6:00 p.m. PT. On this particular #winechat, moderator Bill Eyer (@cuvee_corner) was joined by Morgen McLaughlin (@sbcwinelady). She is the recently installed Executive Director of the Santa Barbara County Vintners Association. The SBCVA was kind enough to provide me and about ten other wine writers with a battery of six white wines from Santa Barbara County for the purpose of the event. Further disclosure: I am a huge fan of Santa Barbara County wines and love having such a great and diverse wine region in my backyard. Santa Barbara County gets a lot of attention for its Syrah and its Pinot Noir, but there are some world class whites there, too. All four of Santa Barbara County’s AVAs got into the act. Represented on the #winechat were Chardonnays from the Sta. Rita Hills and Santa Maria Valley, Sauvignon Blancs, Viognier and Arneis from the Santa Ynez Valley and Happy Canyon of Santa Barbara AVA. The SBCVA was established in 1983 and currently has over 100 wineries and more than 20 vineyards as members. Sporting over 20,000 acres of vineyards and 65+ varieties, Santa Barbara County's wine industry has gone from next-to-nothing to a billion dollar business in less than 35 years. As you might expect from an organization of wine people, the SBCVA has a big heart, too. They have helped raise more than $40 million to aid folks around the world. What makes Santa Barbara County unique among California wine regions are the transverse mountain ranges which make for distinct microclimates. The ranges run east and west, rather than north and south, so the cool marine influence of the Pacific Ocean is channeled inland across the county. Chardonnay, Pinot Noir and Syrah are the three top varieties in SBC, particularly in the western part of the region closest to the ocean. In the eastern part of the county, Rhône and Bordeaux varieties do quite well. Winemaking in Santa Barbara County began in 1782 when Father Junipero Serra brought for planting cuttings of what would come to be known as Mission grapevines from Mexico. Sacramental wine was the impetus, but Spanish rancheros also grew grapes and made wine for less lofty purposes. In 1884 Justinian Caire imported vines from France and planted a 150-acre vineyard on Santa Cruz Island, just off Santa Barbara's coast. He made award-winning wines there until 1918. Prohibition ended his efforts and stymied the entire wine industry in California and the rest of the US. After Prohibition, a couple of UC Davis viticulture professors tabbed SBC as one of the state's potentially great grape-growing areas. It was not until the 1970s that grape-growing and winemaking really took off in SBC. Through the '80s, experimentation pinpointed which grapes did their best in which locations. Here is what all the fuss is about, the beautiful and varied white wines of Santa Barbara County. This selection of six wines shows the diversity of SBC's terroir. Greg Brewer and Steve Clifton use grapes from the Sta. Rita Hills to make their Chardonnay and Pinot Noir in Lompoc. Brewer is also winemaker at Melville and has his own label, diatom. Clifton owns Palmina Wines. Brewer and Clifton made 288 cases of this stunning Chardonnay, which retails for $48. Lee Gnesa (knee-sa) planted his sandy, four-acre plot in 1996. It has been farmed by Brewer-Clifton's vineyard team since 2009. This wine's bouquet is a beautiful example of earth and oak playing off the lemony fruit. It appears as a lovely yellow-gold in the glass and tastes of sweet citrus, cantaloupe, herbs and spices. The acidity is fantastic and there is a touch of chalky salinity that shows on the palate. At 14.5% abv, it's a fairly hefty white, but the Gnesa Chardonnay does not mimic the old-line "big California Chardonnay" stereotype. It's a lean, mean Chardonnay machine. Part of Summerland's Single Vineyard Collection, these Chardonnay grapes come from the Sierra Madre Vineyard, one of the oldest vineyards in the AVA. The wine turns in a 14.1% alcohol number and retails for $35. Summerland Winery sources grapes from up and down the Central Coast AVA and produces the wine in Santa Maria. The cute little seaside cottage tasting room is in Summerland. Owner Nebil "Bilo" Zarif and winemaker Etienne Terlinden produce some outstanding boutique wines, some of which are popping up on Los Angeles restaurant wine lists with increasing regularity - usually the Pinor Noir. Upon first tasting, I thought, "this Chardonnay is for those who like a good deal of oak influence in their wine." From the golden color, to the rich and spicy nose to the buttery palate, every stave of oak seemed apparent to me. It turns out the wine didn't really see that much oak, though - fermented and aged six months in French oak barrels, one-third new. Malolactic fermentation was not completed and the lees were stirred every couple of weeks. The nose is bursting with pineapple, lemon and tangerine aromas while an undercurrent of vanilla oak spice carries the sideshow along. The palate boasts tropical fruit and citrus layered with some herbal elements and a bit of oak spice. Putting a chill on the wine reduces the effect of the oak in both aroma and flavor. There's also acidity a-plenty, so it is definitely a food wine. Steve Clifton and his wife Chrystal make wine from Italian grape varieties, and the Arneis grape hails from Piemonte. Translated variously as "whimsical," "rascally" and "a little crazy," it seems to have been named as a winemaker's grape. Not to mention that it is sometimes ornery and difficult to grow. This Arneis is grown in the sandy soil of Honea Vineyard, in the Los Olivos district of the Santa Ynez Valley. Alcohol registers at 13.5% and this wine retails for $20. The Palmina website extols some of the virtues of Arneis as: "a delightful aperitif, but also a wine with enough body and personality to hold its own with a wide range of strongly flavored food – prosciutto, pesto, grilled seafood. Arneis is also a white wine that will continue to evolve with a few years of cellar aging." It gives a golden straw hue in the glass and smells quite interesting. Floral? Yes, but it's more like the flowers and their stalks. Citrus? Yes, a nice spray from an orange peel. There are scents and sensibilities of herbs and spices, too, with a mineral undercurrent. On the palate, apricots hit me first, with a dash of green tea in tow. Minerals are even more noticeable here, and a vibrant acidity runs through the sip just like it belongs - which it does. It finishes with a gorgeous salinity. The grapes are from Paradise Road Vineyard - they call it Paradise Mountain - in the eastern end of the Santa Ynez Valley. At a thousand feet in elevation, the vineyard gets three times the rain of the valley floor. Winemaker Ross Jay Rankin began producing in the late 1990s at the lovely Lompoc Wine Ghetto. He now operates in the state-of-the-art Terravant facility in Buellton. This $24 wine blows a 14.5% abv number and it experienced 100% malolactic fermentation, imparting a rich creaminess. It was fermented in steel, then half was aged in new French oak for three months, the other half in steel. The Imagine Viognier leaves little to the imagination. Lovely golden in the glass, its sweetly floral nose is laced with the aroma of nectarines. On the palate are peaches and melons. The lovely smell and taste of the wine are supported by a delightful acidity that refreshes and makes for great food pairing. I liked it with kernel corn and peas, buttered and lightly dusted with sea salt. The names belong to Dr. Bob Baehner and Vickie Fournier Baehner. Their Bordeaux grape varieties grow on 16 acres of hillside vineyards in the east side of the Santa Ynez Valley. Oaks, chaparral and purple sage dot the countryside. Their vineyards are named for the natural events they both see unfolding on their estate - Sunshine, Rainbow, Moonglow, Misty and Northstar. From Happy Canyon's Vogelzang Vineyard, these Sauvignon Blanc grapes thrives in the warm eastern end of the Valley. They say they try for more of a Loire expression than New Zealand, but I find the reverse is true. This Sauvignon Blanc experiences two-thirds of its fermentation in steel, then finishes in oak, where it stays for six months aging on the spent yeast cells - the lees. There is a 13.5% abv number, and a retail price of $20. Steve Clifton - see him in two other wines here - is the consulting winemaker at Baehner Fournier, but the label lists Nick de Luca as winemaker on this white wine. The nose gives off a lively grassy aroma, with beautiful notes of tangerine, grapefruit and melon. On the palate, the grapefruit comes forth in mighty fashion and carries some orange peel along with it. The acidity is very nice, but it doesn't break out the razor blades. It's more of a lush experience imparted by the wine's time spent resting on the lees. The wine is as fresh as can be, with a touch of creaminess that lasts into the finish. Another husband/wife team, Alan Phillips and Rochelle Fontes-Phillips started this Santa Barbara County small-lot venture in 2008. Their separate wine paths crossed in the Santa Cruz Mountains - he in the cellar, she in the office. Their Sauvignon Blanc is whole cluster pressed, steel fermented and aged, with a 13.8% abv number. They say the wine is made to emulate the Sauvignon Blanc of New Zealand, using grapes grown in the Santa Ynez Valley. Only 112 cases were made, and it sells for $18. The only label on the bottle is a pewter tab, hand-made in South America. This strikes me as a California Sauvignon Blanc rather than one done in the New Zealand or Loire style. Pale gold in the glass, aromas of peaches, pears and apricots lie under an herbal blanket without a trace of grassiness. Fantastic acidity is right up front, while the flavors are mineral-driven fruit with a melon-like herbal sense. Tangerine lingers on the finish, with a bit of the peel. Wine events are fun to attend - in vino festivus - but they usually have a serious side, too. The serious side of wine realizes there are many good causes that can be helped along with a little cash now and then. When you take in cash from a wine event - pardon my socialism - why not share the wealth? 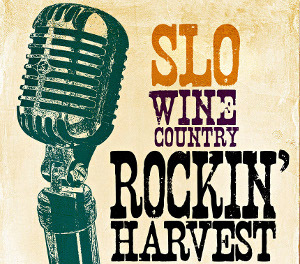 San Luis Obispo area non-profit organizations can apply to share the charity money raised at the 23rd annual SLO Wine Country Association’s Rockin’ Harvest Celebration and Auction, November 1-3, 2013. The live auction portion of the event features a “fund a need” live auction lot. All proceeds from this lot go directly to the nonprofit. The nonprofit is invited to have a spokesperson say a few words to the crowd about their cause prior to the auctioning of the lot. They also receive recognition in the auction brochure and in all marketing efforts prior to the event. The charity has the option of placing items in the day’s silent auction event and benefiting from money raised there as well. In years past, the Harvest Celebration has supported such nonprofits as CASA of San Luis Obispo County, Hospice of San Luis Obispo and Cal Poly. Applications for this year’s event will be accepted through August 23, 2013. The applicant or applicants will then be chosen as the beneficiary of this year’s “fund a need” program. Applications may be found at www.slowine.com. Friday, November 1, 2013 - “Rockin’ Road Trip,” 10 a.m. to 4 p.m. Guests become “roadies” for an afternoon and enjoy a “backstage” look at three SLO Wine Country wineries. From vine to wine, attendees learn the art of winemaking. Luncheon and tasting included. Friday evening, November 1, 2013 - “Collaborative Winemaker Dinner,” TBA. Sunday, November 3, 2013 - “SLO Wine on Tour.” Attendees to Saturday’s Grand Tasting are invited to explore SLO Wine Country all day on Sunday with complimentary tastings. Tasting rooms will offer food, wine and live entertainment along with wine discounts and special offers.